The Inspiron 11 3000 Series laptop is the perfect laptop for the mobile person that does not want to sacrifice power for a lightweight stylish laptop. The Inspiron 11 weighs in at less than 4 pounds and is stuffed with all of the latest technology to keep up with the big boys and also comes in a 2-in-1 design for even more versatility. Have fun and stay connected with friends and coworkers using the built in HD webcam. We will have any available coupon codes and promos available for the new Inspiron 11 3000 Series as well. This is a very impressive computer that anyone, whether professional or young student would love. As far as the design goes, you will be able to turn heads and amaze people with the technology it has. So, if you are looking for the newest in popularity and technology, yet be able to carry it anywhere, then this Dell Inspiron 11 is for you. 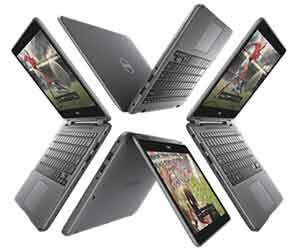 If you would like to save some money on this buy, check for Inspiron 11 3000 coupon codes below. We will have the promotions as they become available. Compare the deals for the Inspiron 11 3000 with up to the 7th Generation AMD processor, 4GB memory, AMD graphics and 32GB eMMC storage, Deals Start at $199.99! Shop the new Inspiron 11 2-in-1 laptop with up to the AMD A9 processor, 4GB memory and 500GB hard drive, Deals Start at $269.99! Do not let the amazing design of the Inspiron 11 fool you though. Dell had power and performance in mind also. With the Intel© Core™ processor it can handle any task needed for home, school or work. It has up to a 500 Gigabyte SSD so you know that it can hold all your favorite media and software. With the almost 7-hour battery life and small, very portable size, you can take this notebook and use it as much as you are going to need.